At the end of Lindemann Rd there is a small parking area, a lookout platform, and toilets. Freedom camping in self-contained campervans is permitted on part of the parking area. 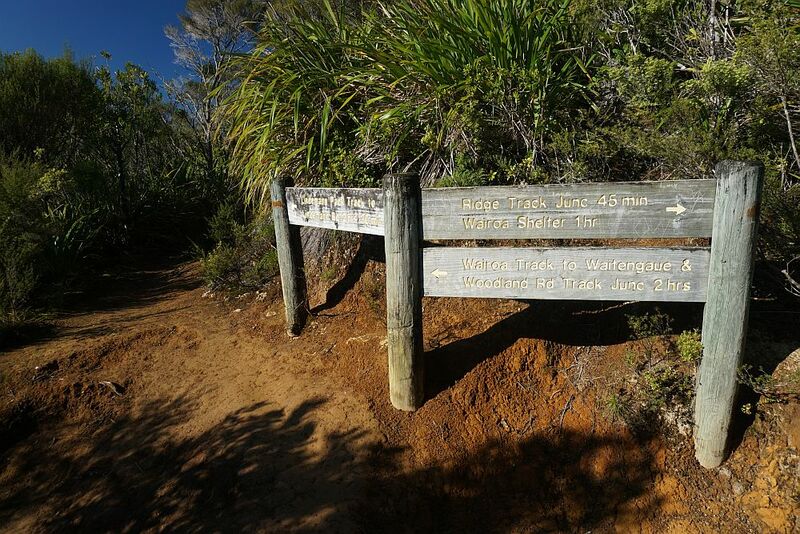 There is information about the track available on the DoC web site, although some of the information may be outdated, with vegetation growth obscuring some of the mentioned views. Since my knees prefer steep uphill and gentle downhill instead of gentle uphill and steep downhill the walk was done in a clockwise direction, taking the Ridge Track first, instead of the direction described on the DoC site. Total distance was just over 13km, and total time 5 hours, including a short lunch break. The distance may not be completely accurate, since the GPS lost satellite reception at several locations by the stream crossings on the Pack Track. 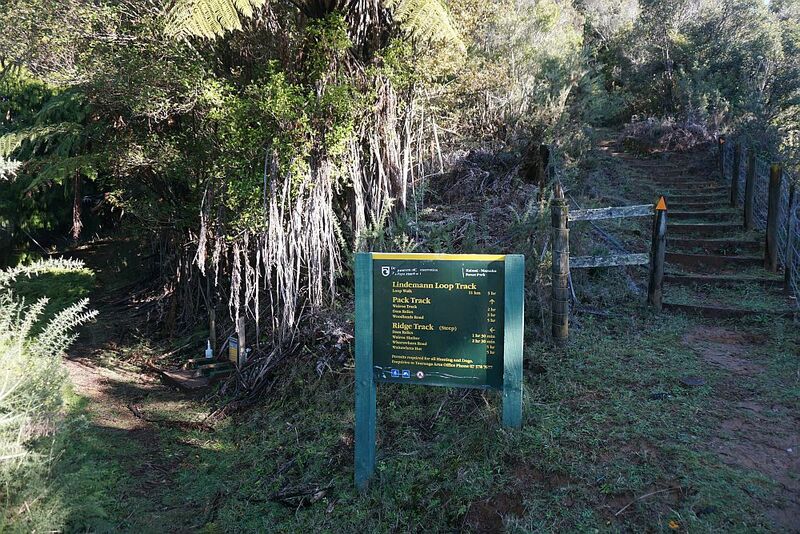 Elevation at the start of the tracks at Lindemann Rd is about 200m above sea level, the highest elevation on the Pack Track about 540m asl, the track junction at about 475m asl, and the Wairoa Shelter at about 520m asl. The parking area and lookout at the end of Lindemann Rd. 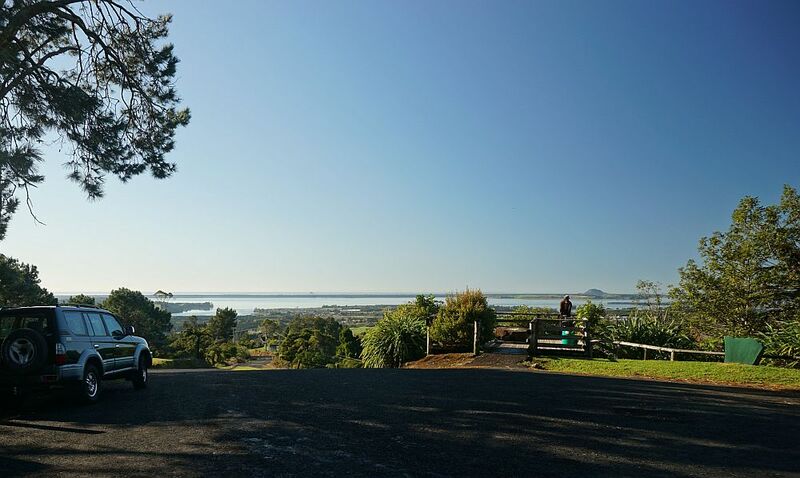 Mt Maunganui/Mauao can be seen clearly to the right above the lookout. The toilets are a few metres down Lindemann Rd on the left. 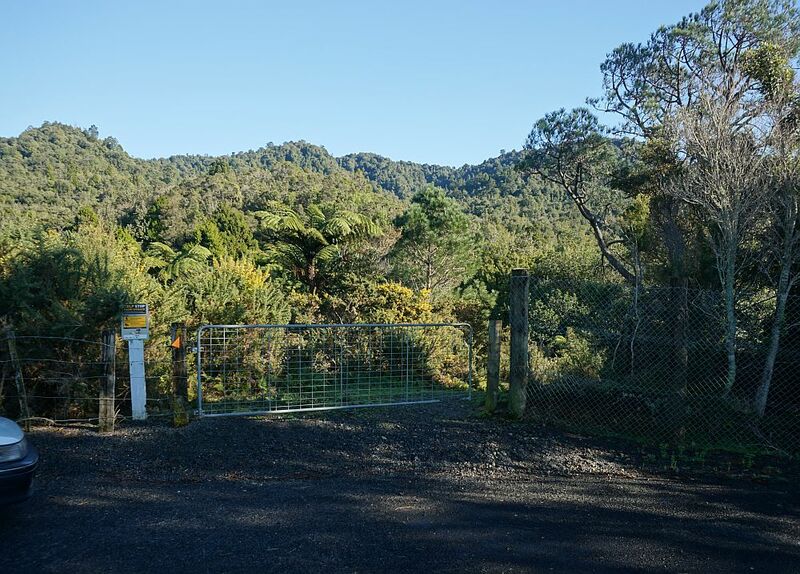 The first 50m or so of the walkway, through the gate, pass through private farmland. Be sure to close the gate after use. 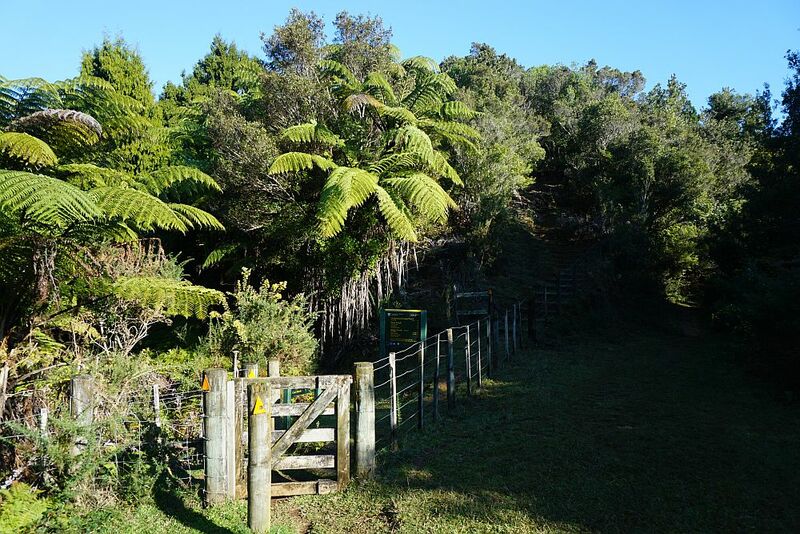 The two tracks, the Ridge Track and the Pack Track, start just past this small gate, about 50m from the car parking area. 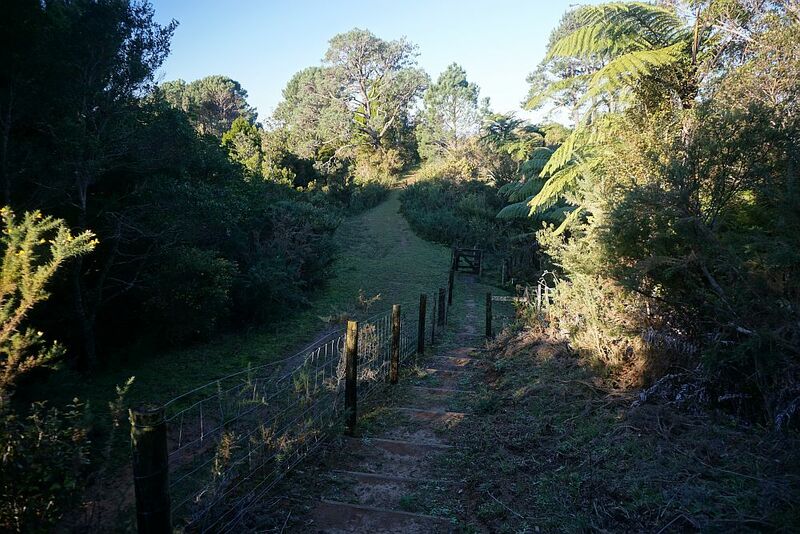 The Pack Track continues up the steps along the fence to the right, the Ridge Track enters the bush to the left. 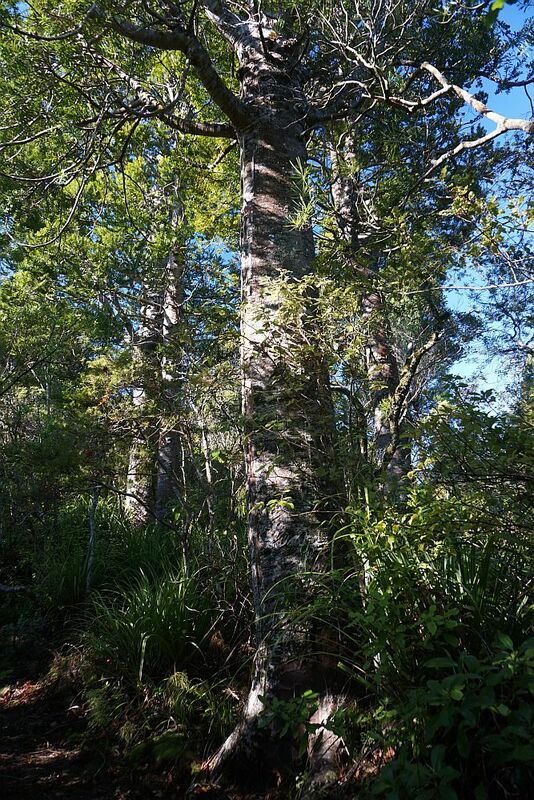 Some kauri trees growing alongside the Ridge Track. 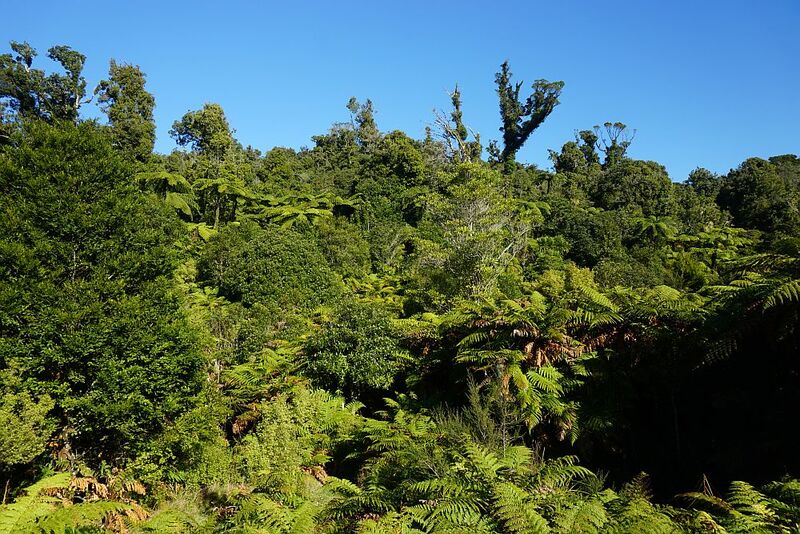 All the millable mature kauri was removed over 100 years ago, so almost all vegetation is regrowth or trees that were unwanted by the logging operators. The Ridge Track starts out with a steeper climb, before a short downhill section, a more level section, followed by another climb. 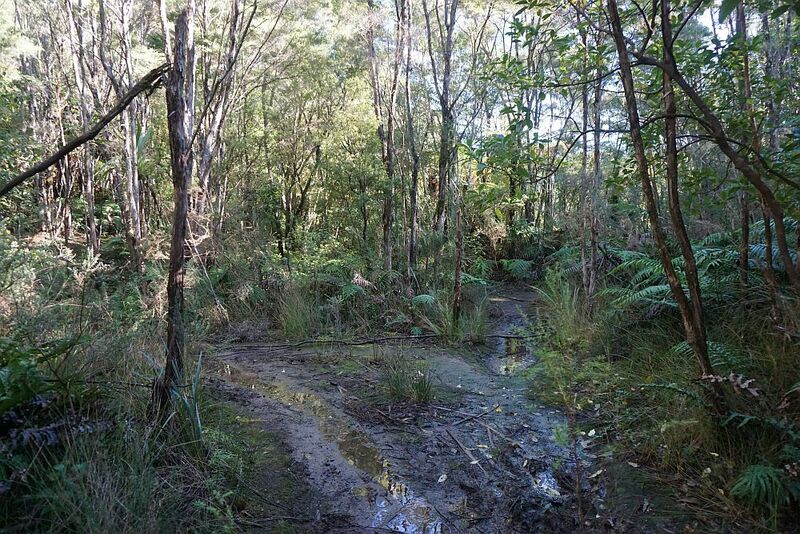 The level sections can be wet and muddy after rainfall, and there are only short sections of boardwalk which can be very slippery. 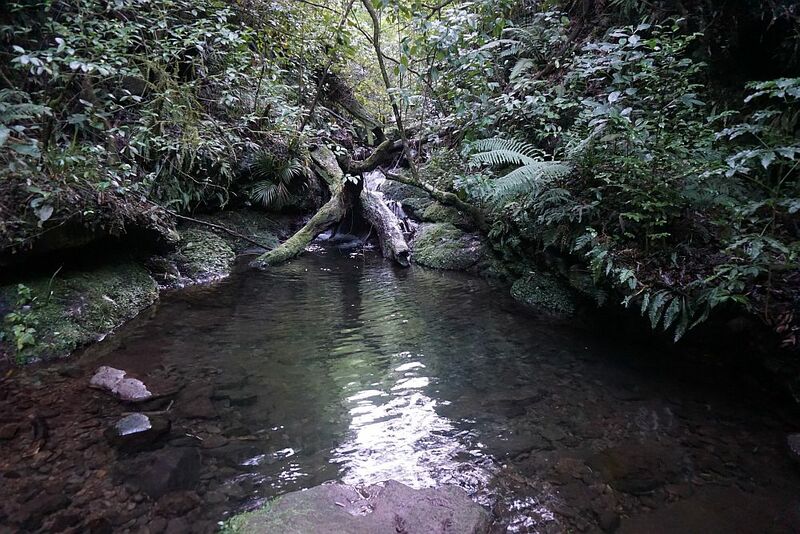 Wooden dams were built in the streams, with felled logs placed in the streams before the dams were breached, the water washing the logs down the stream beds to the nearest access points. Only few wooden beams from the dams still remain. These ones by the Ridge Track. 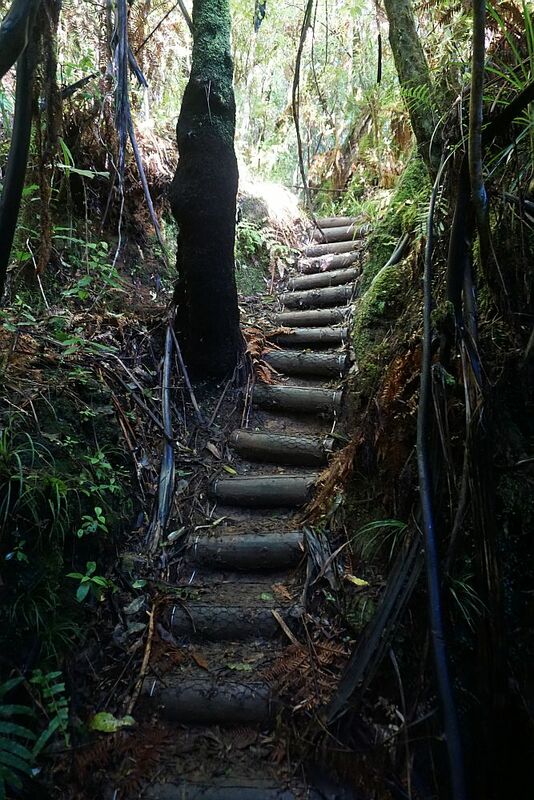 One of only a few sets of steps on the Ridge Track, this one leading from the stream with the remains from the wooden dam. 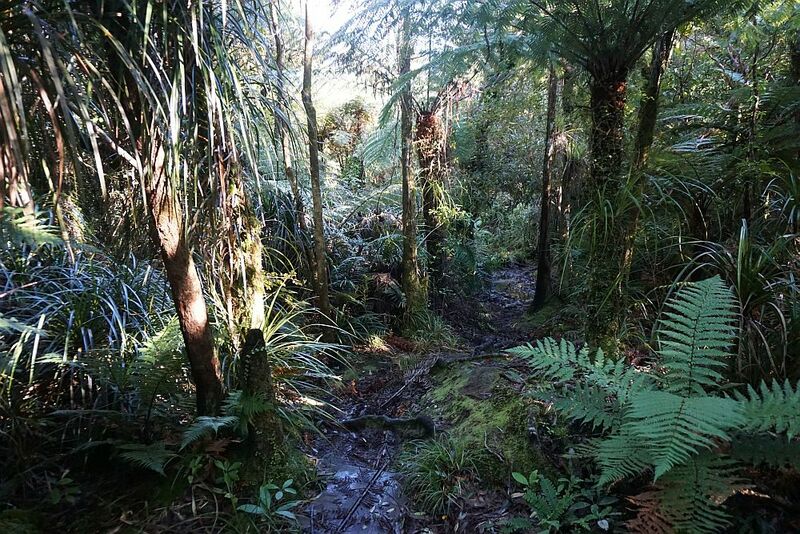 Emerging from the Ridge Track to the junction with the Pack Track (on the right) and the track to Wairoa Shelter (on the left). 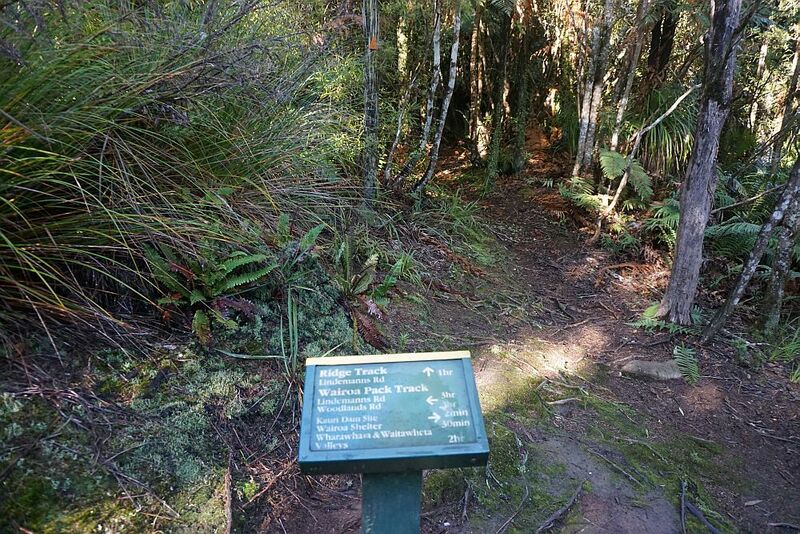 The Ridge Track emerges from the bush above the sign, the track to the Wairoa Shelter is on the right, and the Pack Track on the left. 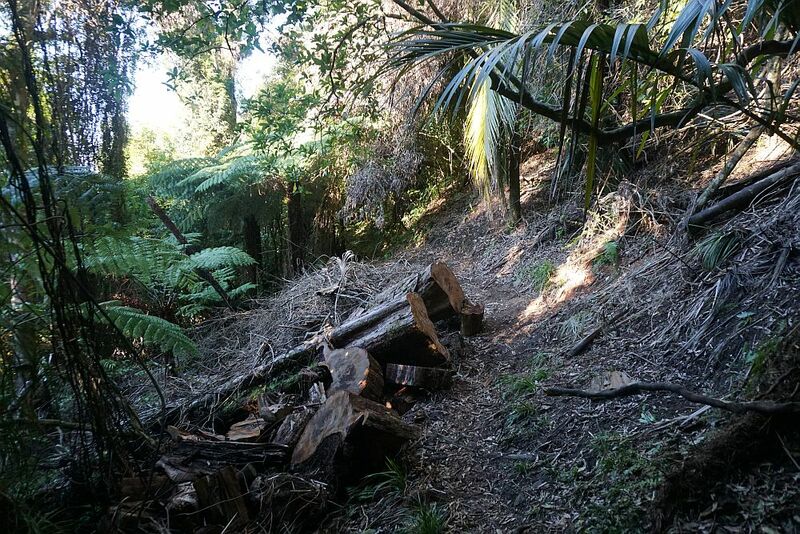 A short distance from the junction the track to Wairoa Shelter continues around to the left, with a short, unmarked track to the right leading to a few remains from another wooden dam. 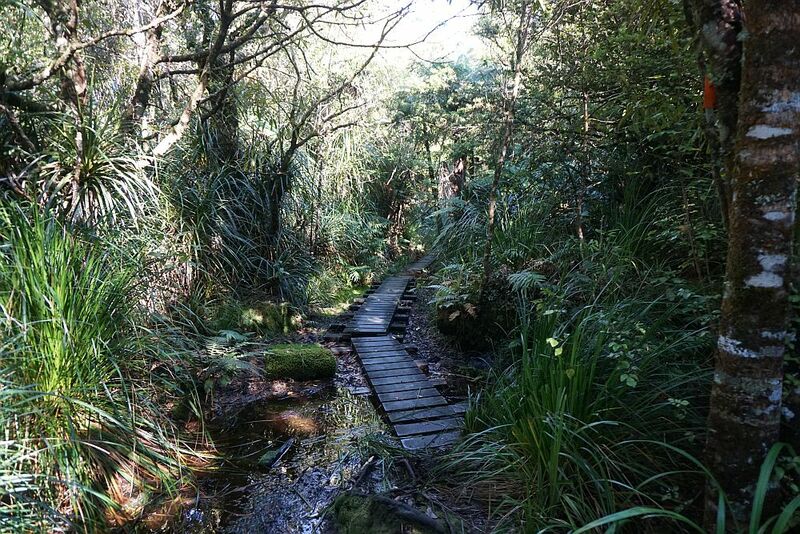 A stretch of boardwalk on the way to the Wairoa Shelter. The boards are very slippery when wet, with muddy footwear leaving them covered with mud. 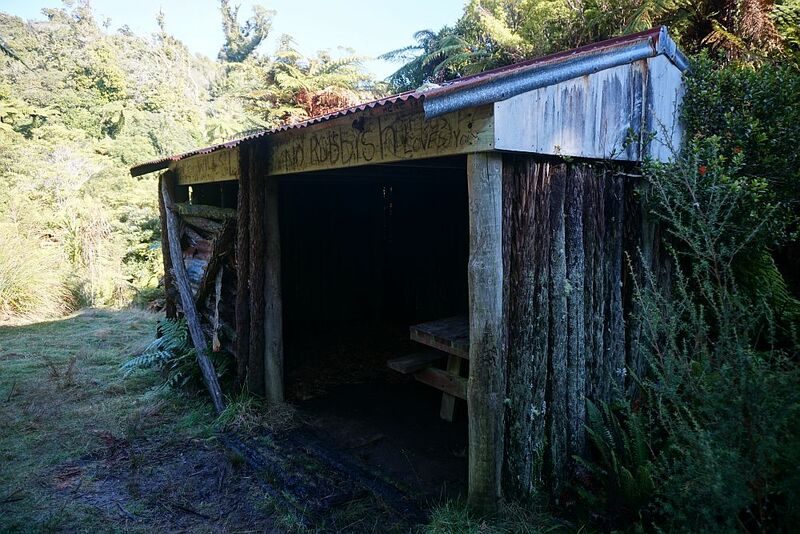 The Wairoa Shelter, located in a small clearing, is very basic, consisting of a wooden frame, a roof, and ponga logs filling in the walls. There is a table and bench seat inside, and most of the floor is covered with fern leaves. 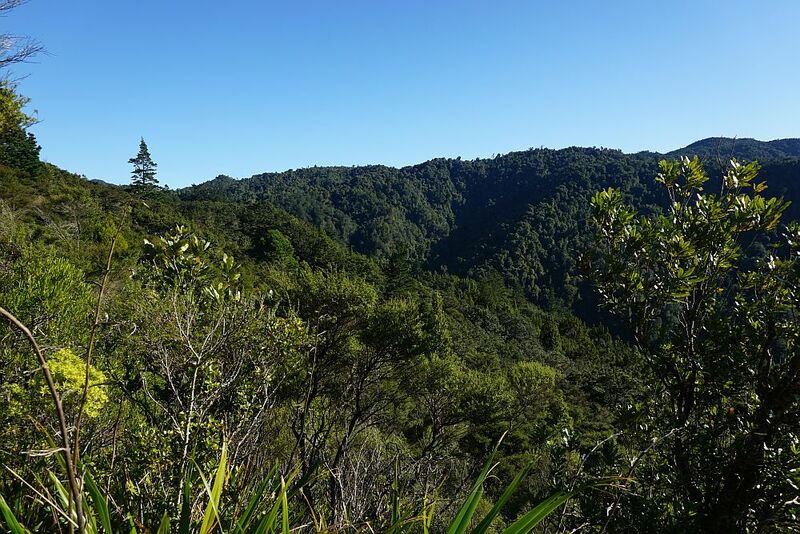 The clearing provided a sunny spot for a lunch break, with views to the bush-covered slopes of the Kaimai Range, before returning to the junction and the Pack Track back to Lindemann Rd. 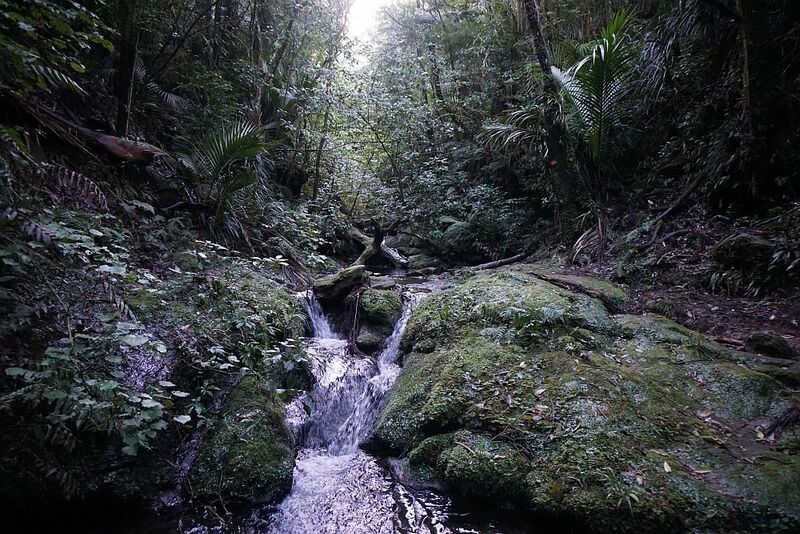 The Pack Track crosses a number of small streams in each of the valleys. 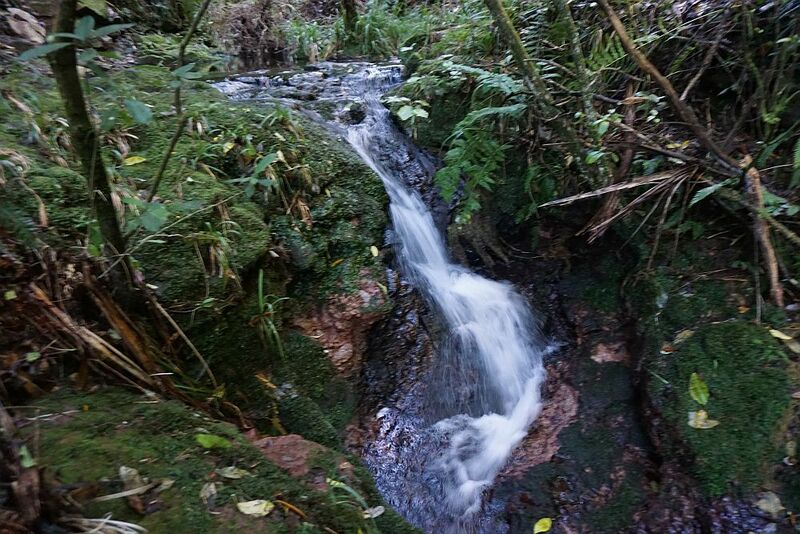 Unfortunately most of the waterfalls on these streams are not visible from the track, but they can be clearly heard. 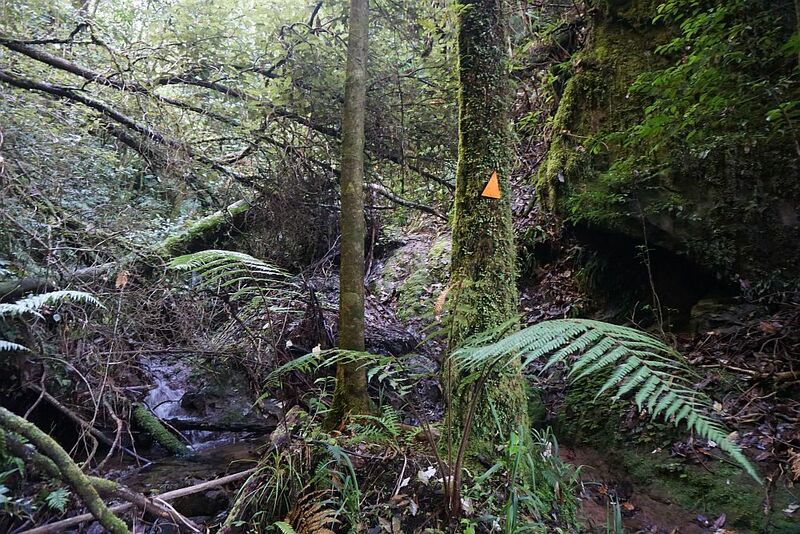 The junction of the Pack Track and the Wairoa River Track is well marked. The Pack Track continues to the upper left, with the Wairoa River Track leading off to the lower left. From the junction there are views over the valley, although the Ananui Falls which should be clearly visible from here couldn’t be found. This was the view looking to the north-west. 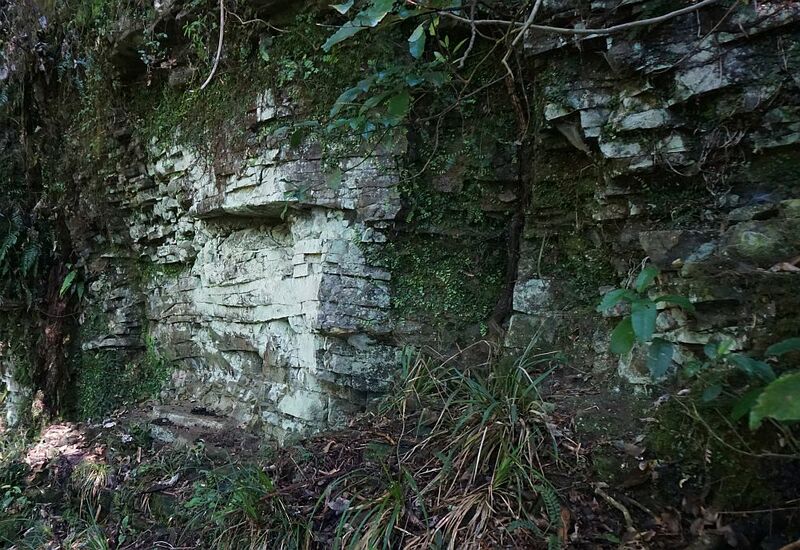 Clearly visible layers make up a wall of rock alongside the track, near another valley with a waterfall. All the layers are remarkably similar in thickness. 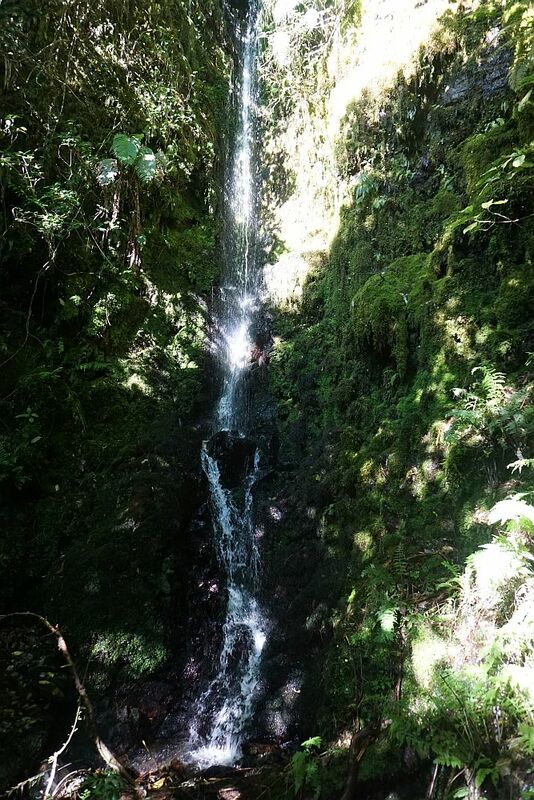 The waterfall near the layered rock wall. 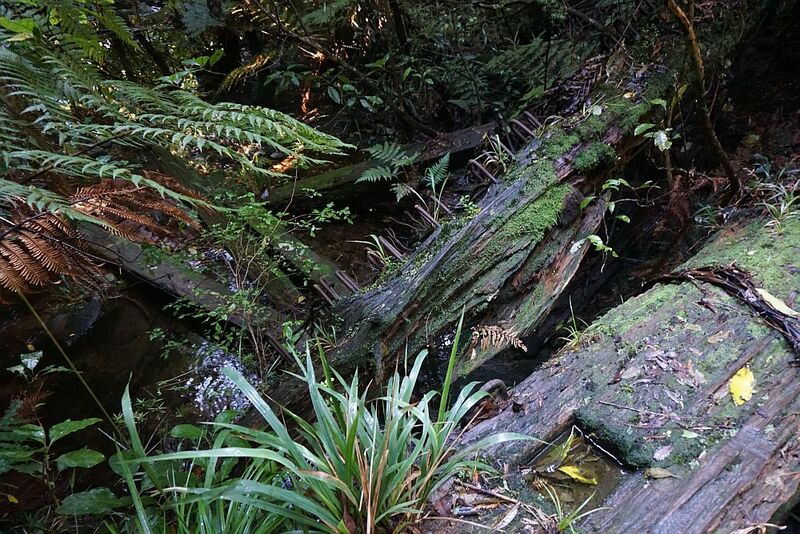 Fallen trees and washouts make some of the stream crossings more difficult. Fortunately the track markers still show the way. 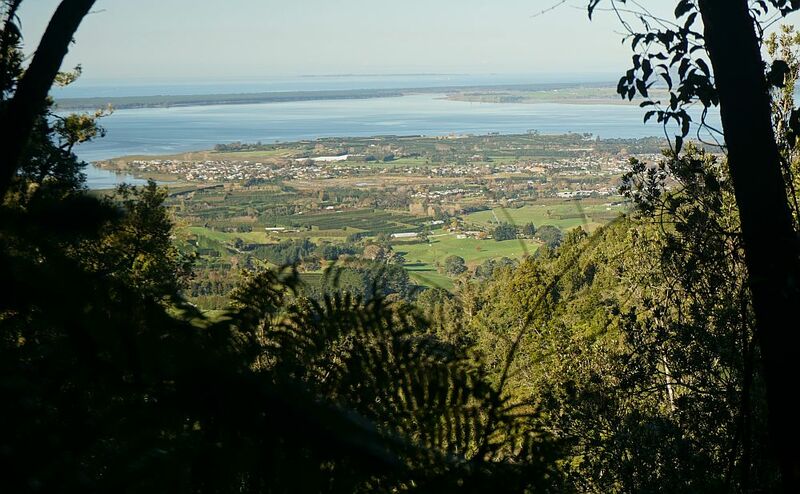 One of the only locations with a view over the Bay of Plenty through the tree cover. Two larger logs fallen directly across the Pack Track apparently snapped just above ground level by strong winds. 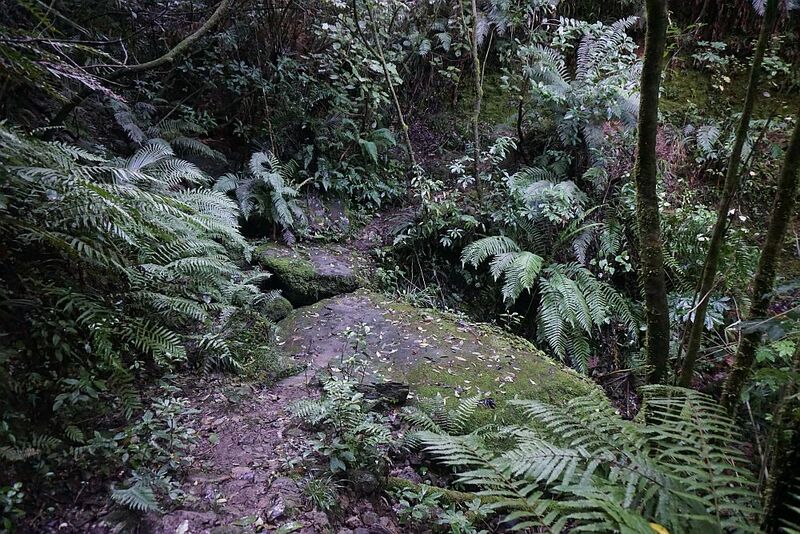 At least this stream crossing was easy, with large flat boulders providing a suitable pathway. ,,, and a small pool, apparently popular for a cooling dip during hot summer days. Approaching the Lindemann Rd junction of the tracks, and the short walk to the parking area on Lindemann Rd. The GPS track log shows the route followed, and the track names. 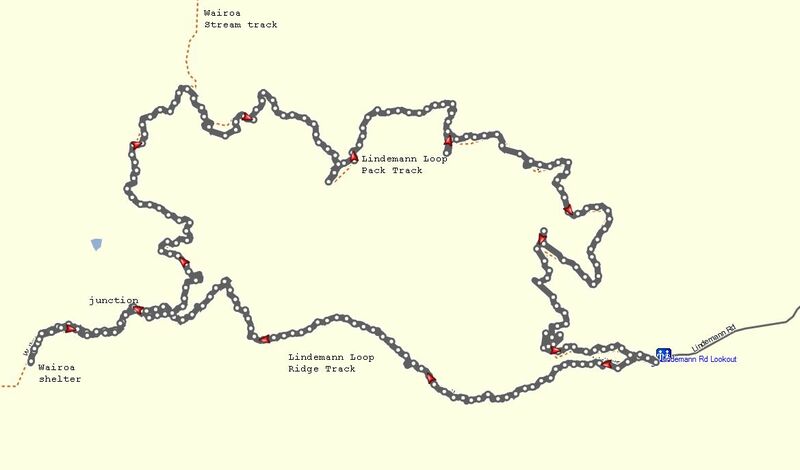 The following were the approximate distances and times for each section of the walk. Lindemann Rd to junction via Ridge Track: 3.5km, 1 hour 30 minutes. 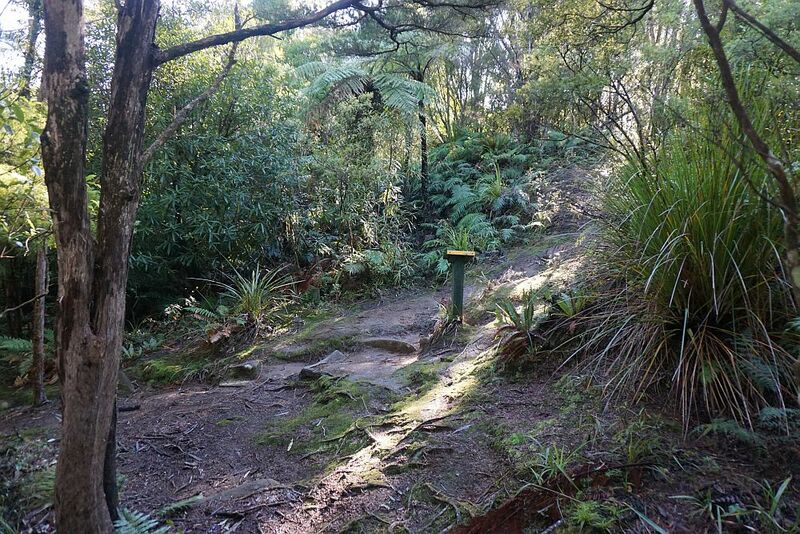 Junction to Wairoa Shelter: 725m, 20 minutes each way. Junction to Lindemann Rd via Pack Track: 8.2km, 2 hours 30 minutes. Total distance 13.2 km, total time 5 hours, including breaks. The track was walked on June 8, 2015.